Homeward Bound recently had the chance to speak with Kelly Sullivan of Doggonit Training in Gilford, New Hampshire. This is the second interview in our interview series of local pet businesses and Ms. Sullivan was generous enough to answer all of our questions! How did Doggonit Training get started? I started Doggonit Training in 2008 after graduating from University of New Hampshire with two degrees: An AS in Animal Sciences and a BA in Psychology with a focus in animal cognition. After completing certifications to become a certified professional dog trainer and working at the NHSPCA’s behavioral department I decided it was time to go on my own and start my own business. So I moved to the Lakes Region and began my journey of building Doggonit Training to what it is today. That marks this year as my 11th year in full-time business and I couldn’t be any happier. I grew up in Bedford, NH and as a young child I always knew I wanted to work with animals. Being able to help dogs and improve their relationship with their owners is a passion of mine. This truly is my dream career! What makes Doggonit Training unique? Maintaining my professional certification requires me to stay up to date on the latest research in the field as I must attend annual conferences and courses to continue my education. So choosing me means you are receiving the most modern techniques. I also offer experience with shelter dogs and service dog training that not all trainers are experienced with. I often work with serious behavioral issues such as aggression which allows me to successfully connect with more than just basic obedience cases. What community events does Doggonit Training support or get involved with? Being involved in the community is very important to me as it is within my mission to create more approachable dogs, as well as more educated owners. Because of this I am involved with the NH Humane Society to create behavioral modification plans to help shelter dogs become more adoptable and help them find their forever homes. I have also been a keynote speaker for the NH Future Business Leaders of America. I am currently working with the Make a Wish Foundation to train a service dog for a very deserving young boy here in the Lakes Region. I am also in the process of creating a therapy dog program for those recovering from addiction. As well as a humane education program to help young children learn essential safety skills, develop empathy, increase their understanding of personal responsibility for animals, and become motivated to make a positive difference in the world. What’s new or upcoming at Doggonit Training that your clients can look forward to? I am currently putting together a board and train option for puppies 2-4 months of age. This will be a fantastic alternative to those that have to work long hours and cannot provide the pup with the proper early socialization and training necessary to create a confident, well rounded dog. We will work on crate training, house training, basic commands, but most importantly we will focus on vital early socialization during the puppy’s critical socialization period. Contact Kelly for more information! What is something that you think people would be surprised to learn about you? I think most people would be surprised to know that I also have a deep love for solo travel. In the past year I have traveled to 8 separate countries on my own and plan on visiting 5 more this year. 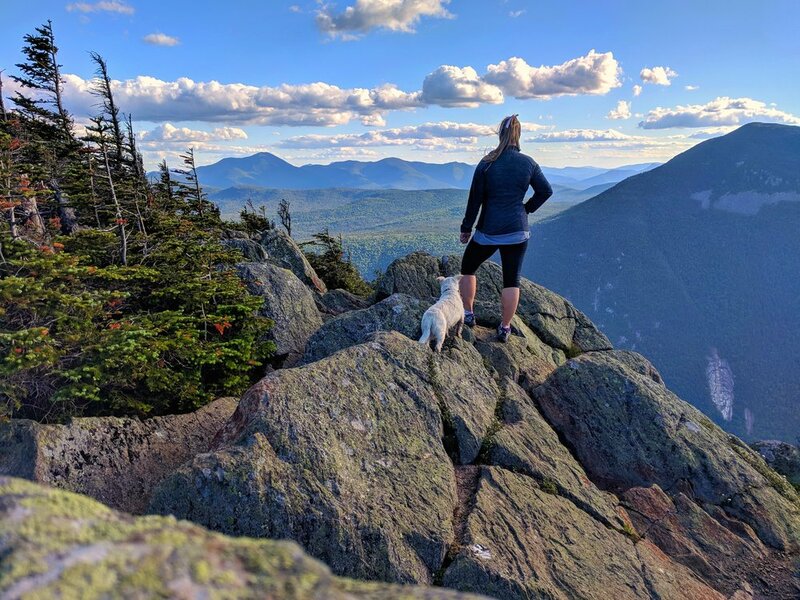 I also love to hike and I am completing the 52 with a view list of mountains here in NH (I’m 32 mountains in!). And lastly, I own a potbelly pig named Mu. Throughout Mu’s life we have done many therapy programs including nursing homes, libraries, and after school programs. I even taught her how to paint so that she can raise money for local charities (most recently the Ramblin Vewe Farm). She has a facebook page if you’d like to follow her. Thank you again Ms. Sullivan for taking the time to speak with us! Are there other Lakes Region Pet businesses that we should interview? Feel free to share your thoughts below!